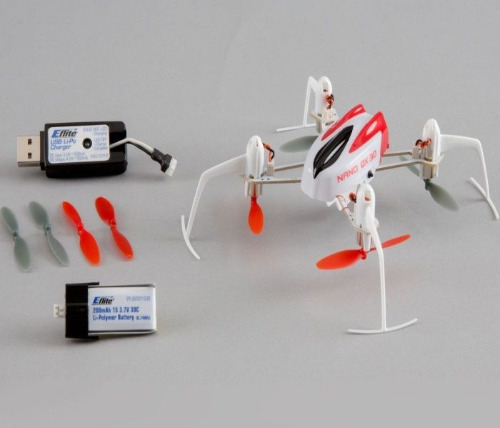 Here you have an E-Flite BLH7180 Blade Nano QX 3D 2.4Ghz Bind & Fly Electric RC Quad-Copter !! This package will include the Heli, (1) 3.7 Volt 200Mah Li-po Battery Pack, Charger, Owners Manual And Original Protective Storage Box !! Please understand that this package includes the complete BNF E-Flite Nano, 3D Quad-Copter, Original Battery Pack, Charging System, Owners Manual And Original Protective Storage Box. DSM2 Or DSMX Compatable Transmitters and you are up and flying !!!! You can't go wrong here when you will receive a Bind & Fly Heli, you have a Low Purchase Price Of Only $79.00 and if you buy it now, you can receive it in just a "few days" !!! So take advantage of this limited time offer and get one of these Great Heli's Now !!! There is only (1) available so Buy Now And Save !! Please buy with confidence and feel free to phone or e-mail if you have any questions or concerns !! OK, so Thank You For Looking At My Item And Please check my other "BUY IT NOW OFFERS" for More Heli's, Parts, Upgrades, Accessories And Many More Great Deals !! The ultra micro Blade Nano QX 3D quadcopter breaks the barriers of maneuverability by making high-speed flips, hair-pin turns and inverted flight simple to perform. Intuitive SAFE™ technology delivers smooth flight, self-leveling and multiple flight modes. Clever design and reverse motor technology allows the Nano QX 3D to be strong and light, so there’s almost no penalty for error if you practice aerobatics over plush carpet or soft grass—you’ll have a blast! Pitch and roll limits are locked to offer a limited flight envelope while electronic self-leveling offers positive stability the instant you release the sticks. You can also flip 360° in any direction at the press of a button. A true 3D flying experience that offers full-range maneuverability with no self-leveling assistance. When flying upright in this mode, 0–50% throttle is negative thrust and 51–100% is positive thrust.